Using the available waterfront in Miami is always a plus and the Mandarin Oriental is one spot where ocean views are put to perfect use. Built alongside Biscayne Bay and with rooms, suites, dining and amenities (it’s got the city’s only five-star spa) to make other hotels envious, this place has it all…and more. 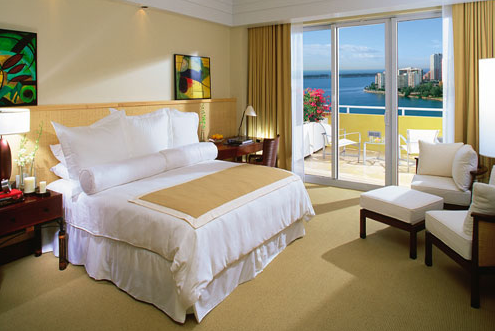 Filled with floor to ceiling windows along the lobby floor, the bay views are unbeatable and breathtaking. They’re visible from just about any vantage point. Head upstairs to the room floors and find luxurious suites that feature fully furnished living rooms with hardwood floors, area rugs and a city view visible through sliding glass doors that lead to a sprawling balcony. The spa suite has a spa tub that towers over the hardwood floors, and is perfectly named the Spa Serenity Room. For great grub, grab a bite indoors or out at the casual Cafe Sambal or something fancier at the signature Azul Restaurant. For a bit of relaxation, swing on a hammock by the resort’s private beach and nearby Brickell offers all the nightlife necessary with bars and nightclubs everywhere.